Mega Rayquaza in game: 278 Who? Important notice! Pokemon Mega Rayquaza is a fictional character of humans. Rayquaza (Japanese: レックウザ Rayquaza) is a dual-type Dragon/Flying Legendary Pokémon introduced in Generation III. 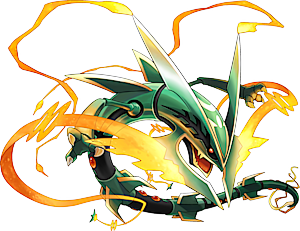 While it is not known to evolve into or from any other Pokémon, it can Mega Evolve into Mega Rayquaza, but only if it knows the move Dragon Ascent and is not holding a Z-Crystal. 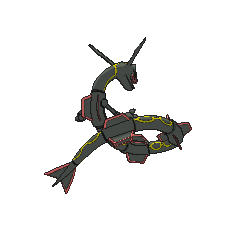 In Pokémon Omega Ruby and Alpha Sapphire, the Rayquaza featured in the Delta Episode must be caught (which requires it to eat the Meteorite) before the player can Mega Evolve any Rayquaza. Rayquaza is the game mascot of Pokémon Emerald, appearing on the boxart of the game. It serves to end the conflict between Kyogre and Groudon when Team Magma's leader Maxie and Team Aqua's leader Archieawakened them. Along with Kyogre and Groudon, Rayquaza is a part of the weather trio, serving as its trio master. In Omega Ruby and Alpha Sapphire, it plays an important role during the Delta Episode and is required to be caughtthere. 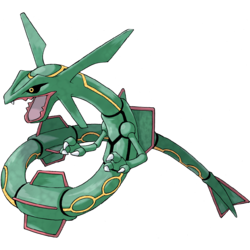 As Mega Rayquaza, its body becomes longer and gains more features. Its head becomes longer with the Δsymbol appearing on its forehead. Its eyes now contain yellow pupils and red irises, and black, tree-like markings trail behind its eyes. Its red lips and teeth become gold, and the gold lines connect to those on its lower horns, which take on a broad, triangular shape. At the outer edges of its lower horns are long, golden, glowing tendrils that each extend to a green, fin-like structure; these tendrils have ring patterns that strongly resemble the yellow markings running along the length of Rayquaza's normal form. Its two upper horns become longer with a gold line running over them in a V shape, and each upper horn has another glowing tendril that ends in a circular shape with a spike. Along the length of its body are golden, glowing orbs placed where its ring patterns used to be. The chin, part of the neck, and parts of its serpentine body are changed to the color black. The fins running along its body are now marked with gold lines; the fins on its tail become entirely yellow and substantially longer. 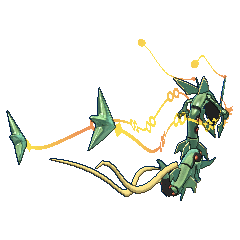 Particles stream from the long tendrils that extend from its jutting jaw; these particles can control the density and humidity of the air, allowing Mega Rayquaza to manipulate the weather. Its green hide sparkles with an emerald-like quality. Inside Rayquaza's body lies an organ that contains the same power as a Mega Stone. A Devon Corporation scientist named this organ the mikado organ (Japanese: ミカド器官). 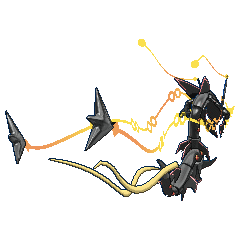 By consuming meteoroids as it flies through the stratosphere, the mikado organ will be filled with enough energy to enable Rayquaza's Mega Evolution. It is able to soothe the other members of the weather trio, even in their Primal Forms. Rayquaza can live for hundreds of millions of years in the ozone layer, where it feeds on water and other particles. Rayquaza is rarely seen by people; even in flight, its appearance is indistinguishable from that of a meteor. Rayquaza is the only known Pokémon capable of learning the move Dragon Ascent. 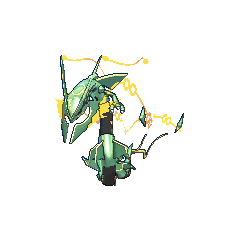 Rayquaza first appears in Destiny Deoxys. It fights against Deoxys, believing it to be invading the Sky High Pokémon's territory when Deoxys was in fact looking for its friend, another Deoxys. A Rayquaza appeared in Mega Evolution Special II, where it Mega Evolved. Alain and Steven tried to battle it, but were quickly defeated by the Sky High Pokémon. It reappeared again in Mega Evolution Special III. In Malice In Wonderland!, a Rayquaza appeared under ownership of Cynthia, but as an illusion composed by Mismagius. When Mismagius fuses with Rayquaza, it becomes the same color as the Mismagius, making it look like a Shiny Rayquaza. Rayquaza made its anime episode debut in outer space in Where No Togepi Has Gone Before!, where it used Hyper Beam on the rocket ship Ash and his friends and Team Rocket were on, presumably protecting its territory. A Rayquaza appeared in SS028, where it was seen by Iris. A Shiny Mega Rayquaza appeared in Hoopa and the Clash of Ages. A Rayquaza had a cameo appearance at the beginning introduction of Pokémon Ranger and the Temple of the Sea, where it ended up captured by Team Rocket operatives. A Rayquaza had a cameo appearance at the beginning of Lucario and the Mystery of Mew, The Rise of Darkrai and Zoroark: Master of Illusions. A Trainer's Rayquaza appeared in its Mega-Evolved state in The Scoop. It was seen destroying the Grand Meteor Delta while being ridden by the Trainer. It later battled a wild Deoxys that appeared from inside the Meteor, allowing its Trainer to catch it. Manabu was seen with a Rayquaza. 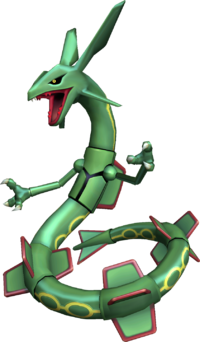 Rayquaza plays a major role in the second Advanced Generation series movie, Destiny Deoxys. Likewise, it appears in the manga adaptation of the film by Takashi Teshirogi. A Shiny Rayquaza appears in Hoopa and the Clash of Ages. To stop the battle between Kyogre and Groudon, Wally and Norman trained at the Sky Pillar and woke up Rayquaza. Five years earlier, Ruby's victory over a Salamence was the reason Norman was banned from the Gym Leader test as the wounded Salamence rampaged in a lab, accidentally letting Rayquaza, who was in captivity at that time, free. Having been ordered to recapture Rayquaza in the five years he was prohibited from attaining a Gym Leader position, Norman attended the Mossdeep Space Center and scrutinized its tracks, finally discovering that it slumbered atop the Sky Pillar when it wasn't scouring beyond Earth's atmosphere. With Wally's help, he was able to awaken and take command of Rayquaza, using it to calm Groudon and Kyogre in conjunction with Ruby's Red and Blue Orbs. When Norman fell under the strain of controlling Rayquaza without a proper medium, it escaped once again. A Rayquaza appears in Pokémon Task Force In Action!! where Red, Clefairy, Pikachu and Tyrogue as usual try to stop it from destroying the city. Rayquaza appears in The Subspace Emissary mode as a boss. After Diddy Kong lands in The Lake, Rayquaza lunges out of the water and grabs him, angry at being disrupted. Before it can further attack, Fox ejects out of his ship, which had crashed and been destroyed by Rayquaza earlier, and rescues Diddy Kong. Enraged, Rayquaza attacks Fox with Dragon Pulse, but Fox reflects its attack back at it, sending it reeling back into the water. Rayquaza soon launches back out and engages in battle against Fox and Diddy Kong. Like all other Subspace Emissary bosses, Rayquaza is later battled again in The Great Maze, and can be fought in the Boss Battles mode after the latter is unlocked. Its attacks in battle include ExtremeSpeed, Thunder, Dig, Iron Tail, and Fly. A Sky High Pokémon. It normally resides high up in the ozone layer where it flies endlessly, so it is rarely seen. However, when Groudon and Kyogre began to fight, it appeared to calm them down. It has the ability Air Lock, which blocks all weather-condition effects. It has exceedingly strong abilities, and its attack power is especially remarkable. Rayquaza appears as an occasional stage hazard in the Dragonmark Chamber of the Kalos Pokémon League stage. Appearing rarely, it flies across the stage at various angles, dealing damage to fighters. Its path is shown briefly by lightning before it appears, giving players time to avoid it. This Dragon- and Flying-type Pokemon usually dwells high in the ozone layer, so it can't be seen from the ground. In the Kalos Pokemon League stage, it occasionally flies at great speed through the Elite Four's Dragon-type chamber, where any fighters in its path will be damaged and launched with great force. Pokémon Pinball: Ruby & Sapphire: Rayquaza is the focus of the third and final Bonus Field. It can only be challenged after capturing Groudon or Kyogre and will then join the circuit of bonus fields. Rayquaza will bounce along from left to right, allowing the ball to roll under it if it is up. It will sometimes use Thunder to paralyze the ball if it is not moving fast enough, though it does stay still while it is unleashing the attack. 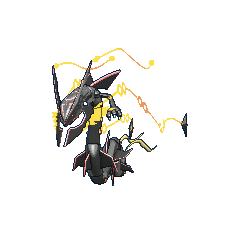 Rayquaza will also sometimes use ExtremeSpeed to compose two tornadoes that cause the ball to fly up into the air for several seconds if contact is made. Rayquaza must be hit 15 times in three minutes to win. After beating the round twice, Rayquaza will be captured. Pokémon Mystery Dungeon: Rayquaza acts as the final boss, living on the Sky Tower. After it is defeated, Rayquaza helps save the world from a meteor. After the credits roll, the player can re-battle Rayquaza to recruit it. Pokémon Ranger: Rayquaza can be captured in a bonus mission after the credits. Pokémon Mystery Dungeon: Explorers of Time and Darkness: Rayquaza is the guardian of the Sky Melodica. 51%-100% HP Like a star blazing in the sky, I shall help you! 26%-50% HP How is this possible? My health is reduced to a mere half? Level up I've leveled up! The vast power of the skies fills me! Rayquaza rampages while spitting energy. It is said to be impossible to capture. Rayquaza is a Zone Keeper. He protects the Granite Zone and the Flower Zone. He's also the Attraction Chief of Rayquaza's Balloon Panic. He values promises. Erases a Pokémon of a different type from Mega Rayquaza (max 10). 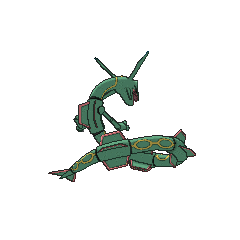 For other sprites and images, please see Rayquaza images on the Bulbagarden Archives. It is the only member without a Primal form, instead having a Mega Evolution form. It is the only member not to be directly sought after by a specific crime syndicate. It is the only member that cannot learn an OHKO move. It is the only member that cannot learn its signature move by level-up, as it can learn it by move tutor. It is the only member that didn't appear in the episodes Gaining Groudon and The Scuffle of Legends. Mega Rayquaza has the highest Attack and Special Attack stats and the highest base stat total of all Dragon-type and Flying-type Pokémon. Mega Rayquaza is the tallest Flying-type Pokémon, the tallest Mega Evolved Pokémon and the tallest Legendary Pokémon. 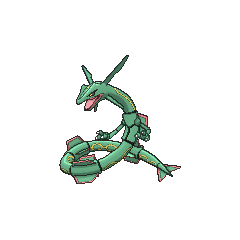 In games prior to Pokémon Omega Ruby and Alpha Sapphire, Rayquaza has a catch rate of 3. It was raised to 45 in ORAS. Rayquaza is the only Legendary Pokémon that can be caught at a higher level than the Elite Four's Pokémon before defeating the Elite Four. This happens only in Pokémon Emerald. Rayquaza was the most voted Pokémon of all pre-Generation V Pokémon in the Korean Pokémon Global Link promotion poll. Rayquaza was also the most voted on the 15th anniversary poll, which was for the game mascots of the core series Pokémon games, making it Japan's favorite game mascot. Rayquaza is misspelled as "Rayquayza" in Pokémon Team Turbo in every instance. Rayquaza is the only Pokémon capable of Mega Evolving that does not require a Mega Stone to do so in the games. Rayquaza is also the only trio master capable of Mega Evolution, as well as the only Pokémon who can have a different held item while Mega Evolved, since Mega Stones cannot be taken off their proper holder during battle. 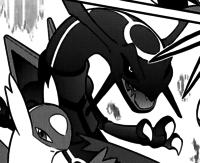 Mega Rayquaza is tied with Mewtwo's Mega Evolutions for the highest base stat total of all Pokémon, with 780. This makes it the only Pokémon with a base stat total above 720 that doesn't require a specific held item. When Mega Evolving Rayquaza, the game will state, "<player>'s fervent wish has reached Rayquaza", instead of the normal message. Rayquaza's battle theme in Pokémon Omega Ruby and Alpha Sapphire is the only battle theme that can play while the player is capable of walking in the overworld; there is a brief period of time between the cutscene in which Zinnia summons it and the battle itself where the player must approach Rayquaza themselves. Rayquaza may be based on the Hebrew legends of Ziz, the unconquerable primal master of the sky. Its counterparts were Behemoth and Leviathan. Rayquaza's appearance also draws inspiration from other creatures of myth such as the Asian dragon and lindworm. Its trait of being capable of inhabiting the skies, and living there while subsisting on nothing but dew and particles for centuries, also bears aspects of the legendary Chinese xian hermit sages and East Asian dragons. Rayquaza most likely refers to Raqiya, the Hebrew word for "firmament". It also may be a combination of ray and quasar. Alternatively, it may be a combination of 烈 retsu (violent or furious), 空 kū (sky), and 座 za (seat or location), which can be taken to mean "one that sits in the ferocious heavens". Rayquaza's mikado organ refers to 帝 mikado (emperor), another name for the Emperor of Japan or 天皇 tennō in Japanese, which can be translated as either "heavenly sovereign" or "king of the heaven/sky". Japanese レックウザ Rayquaza Possibly from ray and quasar. Alternatively, it may be a combination of 烈 retsu (violent or furious), 空 kū (sky), and 座 za (seat or location), which can be taken to mean "one that sits in the ferocious heavens". Mandarin Chinese 烈空坐 Lièkōngzuò From its Japanese name. Can also be taken as "one who sits in the fierce heavens".